Can anyone tell me if the sky Go app is available on Amazon so fire TV? Are you considering buying a Fire TV device, and unsure if its right for you? Or maybe you've already got one, and want to get the most out of your device? Well this guide should help answer any questions you may have, and put you on your way to enjoying even more content at your fingertips. So, Firstly, what is Amazon Fire TV? Back in 2014, Amazon unveiled the first generation Fire TV. A plug in box that could be connected to an HDMI enabled TV, giving you access to smart apps and features on your TV. Due to increasing success of the device, later that same year, Amazon unveiled the Fire TV Stick. The stick gives you similar functionality to the box, but with a much smaller form factor, and more importantly, a smaller price tag. 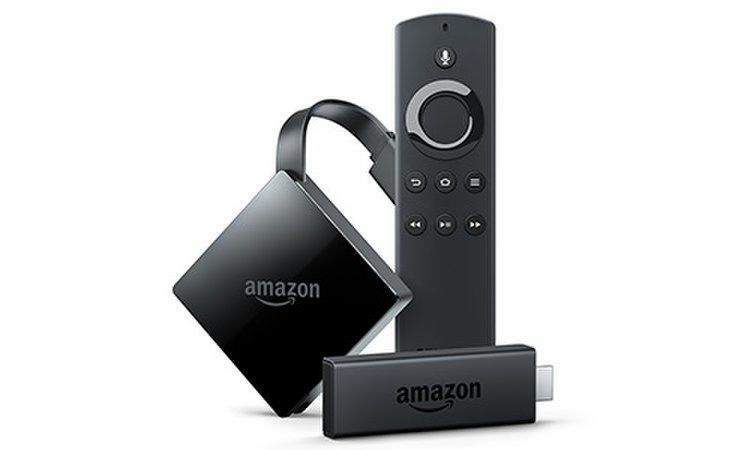 Amazon have continued to revise and improve Fire TV devices, with their latest generation devices supporting 4K, Alexa Voice Control and Search and much more. With now Over 7,000 apps, games and Alexa skills, including Prime Video, BBC iPlayer, ITV Hub, Netflix, and more. Plus, access millions of websites such as YouTube, Facebook, and Reddit with browsers like Silk and Firefox. So, what can a Fire TV device do? The simplest way to view it's features, is to say that it gives you access to hundreds of apps, similar to a mobile phone, with some being free, and some paid; such as video and audio subscription services like Netflix, Amazon Prime, Spotify to name just a few. Okay, what do I need to make it work? Firstly, you are going to need an HDMI enabled TV. The device will need power too! So you will need a nearby plug, and lastly, you will need a wireless internet connection as this is an internet based device. Can I stream 4K with a Fire TV? Yes, on the latest Fire TV device, the box supports 4K video, provided you have a 4K TV, you can start right away and enjoy 4K content direct from Netflix, Amazon Prime TV and others. On the latest generation of devices, yes. You can use Alexa to not only search for content on your Fire TV device, but you can also use it to control your Fire TV, not only from the mic enabled remote, but other Alexa devices such as the Echo, Echo Dot, Echo spot etc. Can I watch Sky programs on my Fire TV? Not officially, no. Some users discovered that the app could be sideloaded (sideloading is a way of installing an app onto the device that is not officially on the Amazon Fire Store for download) but results were mixed, and Sky have since stopped users from gaining access via this method. Can I Use NowTV on my Fire TV? No, as it is a competing product, they do not allow their service on the Fire TV at this time. Can I Jailbreak my Fire TV device? To Jailbreak a device, is to modify it to remove restrictions imposed by the manufacturer. In this case, it would be to install, or sideload, unsupported apps such as Kodi. This can be achieved using various methods documented across the internet. Can I install Kodi on my device? Most, if not all of the generations of the Fire TV devices can have Kodi installed via various methods, but doing so may invalidate the warranty on your device, or cause unexpected behaviour such as crashing, or even worse the device failing to work. We suggest you research heavily on how to do this safely before attempting it. What do i get as an existing Prime member? It won't work, though you can sideload it. It still won't work though. Sky Go won't even work on a rooted phone, never mind a device that isn't authorised at all. It won't work, though you can sideload it. It still won't work though. … It won't work, though you can sideload it. It still won't work though. Sky Go won't even work on a rooted phone, never mind a device that isn't authorised at all. That's not true. I've used Sky Go on an Amazon Fire TV in the past. The only real problems are that the interface isn't ideal for a non touch device and it will suddenly stop working when they update the app, forcing you to side load the new version again. It's just a pain. I bought an old cheap PS3 slim to put Sky Go on instead. You can't get Sky Go to work on any Fire stick/Fire TV box or Android TV box. Even if you use Xposed Installer and RootCloak. Sky won't allow this (your're effectively getting another Sky box for free), same goes with Now TV app. 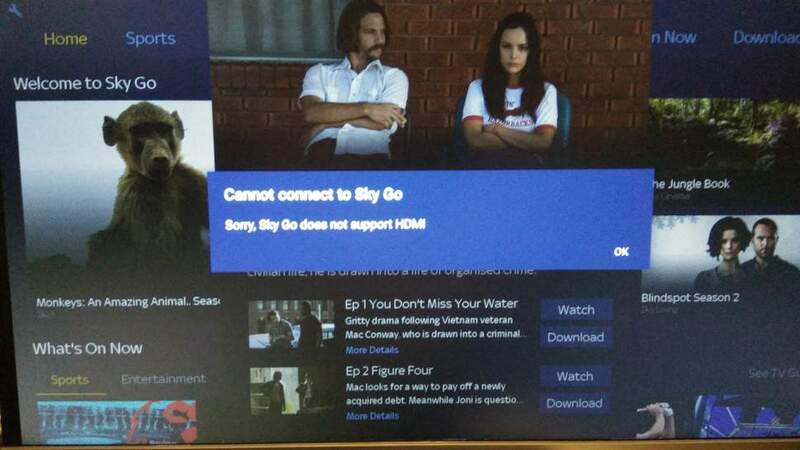 You can't get Sky Go to work on any Fire stick/Fire TV box or Android TV … You can't get Sky Go to work on any Fire stick/Fire TV box or Android TV box. Even if you use Xposed Installer and RootCloak. Sky won't allow this (your're effectively getting another Sky box for free), same goes with Now TV app. You're wrong there, I had it working on two Fire TV boxes until I decided to go for a more convenient solution. I had previously tried it on some cheap and nasty Android TV boxes where it failed, mostly giving the error you posted above. You're wrong there, I had it working on two Fire TV boxes until I decided … You're wrong there, I had it working on two Fire TV boxes until I decided to go for a more convenient solution. I had previously tried it on some cheap and nasty Android TV boxes where it failed, mostly giving the error you posted above. Sky Go will work on Amazon Fire tablets and phones like it would work on any Android tablet and phone but not on any Android TV box like the fire stick and Fire TV box. it used to work but sky altered the interface to stop it. it now only works in german. Sky Go will work on Amazon Fire tablets and phones like it would work on … Sky Go will work on Amazon Fire tablets and phones like it would work on any Android tablet and phone but not on any Android TV box like the fire stick and Fire TV box. You must be telling me I imagined things then? I'm saying if you tried now you wouldn't be able to, check the xda forum. Oh I see. I hadn't realised things have changed so recently. I'm sure it's only a matter of time till somebody finds a workaround though. They always do! so are there any dongles that i can use to get sky go on a kids tv upstairs?